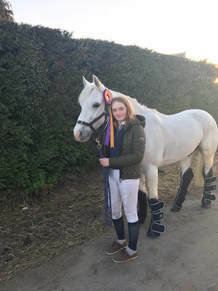 Congratulations to Megan, Rachel, Ellen and Holly who participated in the IPC National Dressage Day in Spruce Lodge on May 5th. Rachel won Junior, Holly was placed in Intermediate and Megan was placed in Open. 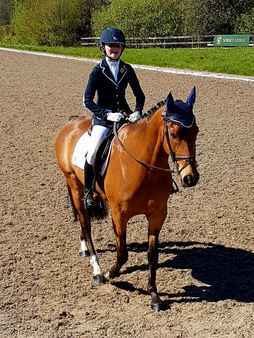 Combined Training is the combination where members ride a dressage test in a 40m arena followed by a showjumping course. As with all other Pony Club activities combined training is divided into different age categories such as U10, U12, Junior, Intermediate and Open. Each category has a different test and these tests are set by the Pony Club in Spring of that year. Each age category showjumps at a particular height,eg U12 usually at 75cm, Junior up to 90 cm and Intermediate at 1 metre. Each Area of Pony Club has a qualifier competition for members at Junior,Intermediate and Open Level. This year the Area one Qualifier will take Place in Boswell Equestrian on July 18th. The top placed members on the day will then qualify for the Pony Club Festival which takes place this year in Mullingar Equestrian Centre from July 28 th to July 30 th. U10 and U12 members who have trained and wish to compete at the Festival in Combined Training may enter directly subject to approval from their D.C.
would encourage all our members to start training early in the season. We have organised Flatwork Clinics both with Ciara Kelly and Sam Watson and Showjumping Clinics will start in due course. If you have any queries about Combined training please contact Bairbre on 087 2745863. 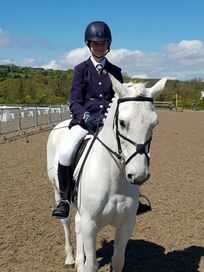 Pure Dressage is a competition organised by the Irish Pony Club in which teams of three/four riders of any age ride a preset test in a 60m long arena. As horse and rider are expected to perform from memory a test, this require discipline, obedience and flexibility and is therefore the basis for all other equestrian disciplines. Members who have trained are welcome to attend the National Dressage Day in Spruce lodge in Co. Wicklow on June 24th. At the National Dressage Day members are invited to do both a tri dressage and a competition test and this experience is invaluable to any rider.